Here are Madame Justice Dillon's written reasons for decision in Canadian Forest Products Inc. v. Sam, 2011 BCSC 676 (the Redtop case). 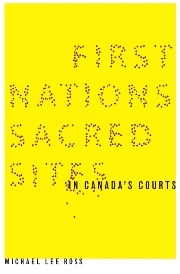 The case found its way into the courts when Canfor applied for an interim injunction preventing members of a Wet'suwet'en Chief's family from blocking a road (video) and thus preventing the company from proceeding with its provincially permitted logging operations in a portion of the Chief's House territory, with the design of harvesting trees affected by the mountain pine beetle epidemic while they still have economic value. In turn, House Chief, Kelah (aka Mabel Crich), and Head Chief, Hagwilneghl (aka Ron Mitchell), sought an interlocutory injunction restraining Canfor from engaging in timber harvesting in the Redtop area, a culturally vital portion of the larger House territory (Ilh K'il Bin) for which Kelah bears the primary stewardship and decision making responsibility by Wet'suwet'en law.